Our wide range of Kriesler Hill Std. Chinrest come in chrome bracket finish. Made using high quality boxwood, these products are durable in quality. Having unmatched quality and the reasonable rates, these chin rests have made a wider market for themselves. We are engaged in Supplying Guarneri Chin Rest, Guarneri Violin Chin Rest. 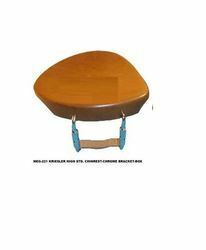 We are engaged in manufacturing and supplying an exclusive collection of Wooden Chinrest, which is appreciated to give maximum comfort. While playing the instrument, string players can place their chins on this and feel comfortable. This is beautifully crafted using best quality wood procured which makes it durable in nature. 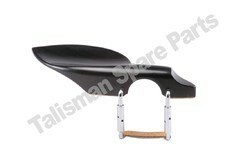 We are engaged in offering Kaufman Chinrest. Our boxwood berber model are produced from high quality Indian Ebonywood, Boxwood & Rosewood and are durable in quality. The excellent polish on them provides superior finish and elegant look. Available in different wooden product, These accessories have awesome demand amongst the musicians because of their excellent designs and durability.